“So what”, you say? Well, having JSMad means that now Firefox can play MP3 files without any Flash. It also means that you can listen to MP3 in the browser without the 64bit issues on Linux. 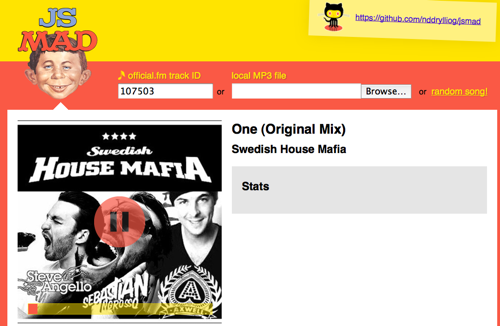 With JSMad we can dive deep into the MP3 format and not only play the song but also get information about it. It allows us to build a lot of native dj-mixers, samplers and sequencers in the nearer future. Right now JSMad works in Firefox 4+ and on Chrome 13.0+, if you enable the Web Audio API in ‘about:flags’. I remember when MP3 came out and my computer back then was too slow to encode it without locking up in WinAmp. Back then a scene player also helped me out. Now we do the same inside a browser rather than desktop applications. Too bad that playback hiccups when the tab isn’t active. As Mardeg mentions below, this is a Firefox bug (or rather, a feature). We might work around it temporarily by writing more audio buffers than asked for when detecting that the callback is not called often enough. Of course, when Audio workers are ready then we’ll switch to that. Until then, just play your mp3s in a separate window :) That works well. I don’t experience that same issue as you describe. It plays fine whatever I do. How is the CPU usage on your machine? There is of course the issue of using settimeout so many times a second that when the tab loses focus so you can listen to it while in another tab, bug 633421 kicks in and then you get bug 665000, linked in my name. Hopefully once bug 615946 (Audio workers) is implemented people can switch to using those. I suppose this might still be patent encumbered. Probably not, as distributing the *source* of libmad is legal. However, distributing binary codecs (ie. a compiled version of libmad) requires a license from Thomson/Fraunhofer. Compiling jsmad’s source code (ie. trying out the demo) qualifies as non-commercial, personal use so it’s alright I guess. I’m not a lawyer though :) We just ported GPLv2 code, we’ll let the legalistas figure it out. JSMad means that now Firefox can play MP3 files without any Flash. How dose this works anyway this is the best solution for a option for using plugins, i am using many plugins for flash and many other media embeding, now i hop this kind of features will help us to remove these plugins. Just tested the site with FF5, and works perfectly!! Does Mozilla have an official position on (or tracking bug for) when it’s going to add mp3 support to the audio tag? I’m guessing that once it’s out of patent protection then there aren’t any other problems. (I know Vorbis is better quality, but the ridiculous installed base of mp3 is an overwhelming argument in my mind, as is the possibility that others will push for AAC to be the de facto standard). I’ve seen statements suggesting 8th December 2011 as a possible date for all playback patents being expired (in the US, probably earlier elsewhere). I’ve also seen 8th December 2012 so it would be good to have someone respectable like Mozilla, Wikimedia, Ubuntu or the FSF weigh in on the matter and back up their stance with action. I’ve also seen it suggested that if some individual patents still apply then these could be worked around. You might be able to create an mp3 that would play in a future Firefox as well as Flash, Safari, your iPod etc. while still not being able to play any and all random mp3s in Firefox. Slightly confusing for web devs, but better than nothing. Cool hack by the way. I was going to suggest Flac would be cool too, but it seems that I/O rather than decode is the bottleneck, so it’s probably not feasible. Chrome supports MP3 playback already through HTML5. I thought Firefox 4 did as well. I know it supports ogg. It does for OGG as that’s a free and open codec. Not for MP3 though, as that one is not. Certified 30+ years Master in IBM Microsoft IT Cisco Red Hat Security et al – I found one tiny little problem with this wonderful program if it can be fixed. Great job, but can you tweak it so that the Plug-in does not run all the time? It is ironic because when I use the Sys Internals – it isn’t showing; in addition to the other Programs I have, but thank goodness for that Developer Tools in the IE 9 I would had never caught that! Having an I/O (on/off) switch ON a FF toolbar in FF 5 and higher – and possibility if they want to activate it in IE 9, you might just made tons of Script Kiddies in IE Bandwagon really upset right there if you smack down with your program and it’s copyrighted (Neener Neener Boo Boo! to them! :P) … MAD! I found this to actually even work great alongside with Microsoft’s Silverlight / HTML 5 as well. BUT ….. there is a Security Issue there that leaves the door of vulnerability wide opened; provisions of clues above should direct you, the Developer where to find it – FIX IT ASAP and you’ve just built yourself a better Mouse Trap and FF better get this program copyrighted ASAP and reward you richly! I can picture it – FireFox – the ONLY BROWSER that has the capabilities and flexibilities for everyone – how to use this simple program: would be so easy to understand the I/O switch on their toolbar and how it works. I mean, it isn’t that hard or complicated. CONGRATS AND KUDOS TO YOU – YOU’VE GONE WHERE NO MAN HAS BOLDLY GONE BEFORE! (applause)…. Any idea when WebAudio API will be enabled by default in the browser? Yes, documentation is completely lacking at the moment. Meanwhile I’d of course advise you to take a look at jsmad.org’s source code to see how it uses the player – it’s not that complex really, it’s just missing a few more complex things like seeking, etc. Doesn’t work here. All I get is tiny choppy segments of sounds on firefox. On chrome and epithany I don’t hear anything at all. On firefox i also get choppy playback. I also tried the flac decoder. Also works, but also choppy playback on firefox. On Chrome, both the flac and mp3 player work fine.